I have decided to go outside of my “Japanese comfort zone” and try a few different brands that are rarely reviewed on beauty blogs. Every time I’ll find a new brand and try it I will share it with you. I won’t have that many brushes but it might already give us an idea about the brand. This first part, and my first attempt to conquer a new world of magnificent brushes, was made with the Rakuten website. This site is in several languages, you can of course order in English, then I received my emails in a mixed Japanese/English text but it is not a real problem since you can translate them with your email client or with Google translator. The order was placed on December the 20th and arrived here in Switzerland on the 28th, not bad at all ! Rakuten have access to several brands, like Fine Kalla, Tauhaus, Miyao, etc… I don’t always know what brand they are exactly, since it’s written “Fine Kalla” on the handle I believe this is the brand name but honestly I am a bit confused. I had no idea what to expect as I had never heard or read about them, I knew it was a risk but I had to try, it also helps to be able to better compare with other brands like Hakuhodo, Chikuhodo or Koyudo. The best of these 4 brushes is this Fine Kalla KK-002, we have here THE dupe for the Suqqu cheek brush, to me it’s even better, the Suqqu I own is quite flat, when I look at it on other blogs, it looks like they had a more tapered version of it, for example here. Mine is not bad at all but just not tapered. When I saw this brush, it reminded me of the Suqqu, but the Suqqu is actually nearly double the price tag. Same type of handle same sleek finish but the Fine Kalla has multi-colored sparkles inside it, it’s … GORGEOUS, it looks kind of magic. The hair has the same softness as the Suqqu, you cannot tell a difference and if you can, it’s soooo micro small that it’s not worth going for the Suqqu. Expect the same quality as a Suqqu brush if not even better, same softness, same density. The Fina Kalla is slightly more firm at the tip of the brushes but that’s also why I love it more than the Suqqu. It’s a perfect luxurious and incredibly soft brush. This brush was a gigantic discovery. They also have the bigger version that looks similar to the big Suqqu powder brush and is less expensive. 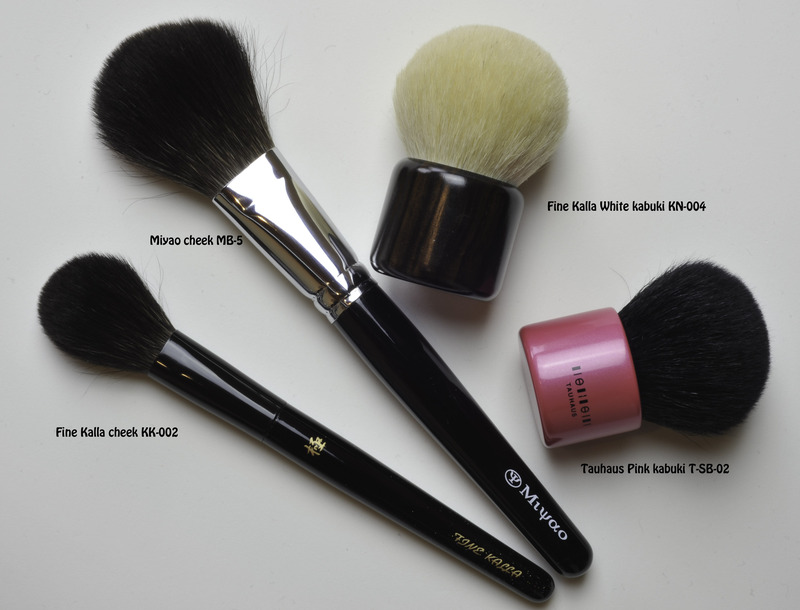 The Miyao blush brush reminds me of the Lunasol. The ferrule is not that well finished, I prefer when the ferrules don’t have “crimps” (more like the Suqqu or Lunasol) but it’s just a personal preference. The size is between the Lunasol blush brush and the powder brush but the Miyao is flatter, thinner, less densely packed and feels even softer. I prefer the Lunasol brushes but this one feels incredibly soft on the skin. I will use it more like a fan brush or to lightly apply powder. This pink kabuki reminds me of the Koyudo H005 but the Koyudo is a mix of squirrel and goat, therefore softer for sure but also more nicely bundled. Not the same quality at all, well not the same price too (the Tauhaus is nearly half the price). I also own the R&R kabuki, it’s bigger but it’s much softer than the Tauhaus kabuki. This Tauhaus kabuki doesn’t hurt, well, it’s not incredibly pleasant to use but it doesn’t hurt. Bottom line : I prefer to pay a bit more and get a softer kabuki, the Koyudo is one of the best kabukis you will ever find, it’s very dense and very soft, maybe that’s actually the perfect balance between density and softness that help to apply the perfect amount of bronzer and flawlessly blend and it’s insanely easy to use. The Hakuhodo is a great -extremely dense- kabuki but really really expensive. The R&R is also softer than the Tauhaus and I also prefer it. This white kabuki is not good I am afraid, it’s difficult to believe that it’s the same brand as the first brush shown at the top of this post, The hair feels terrible against the skin, I don’t even want to use it at all, I tried but I just don’t want to do it again until I wash it over and over again, maybe it will improve. The hair are very thick and rough, I imagine that thicker hair are great for foundation/liquid products but the day I find the courage to try it, I’ll tell you. It has a very strong smell that was sticking to the room for more than 1 day, well until it dried completely. You would know in which room it was because you could follow it with your nose. I will wash it a few times and then I will try it. Recently I ordered a Koyudo with thicker hair (BP013), it really has much thicker bristles than many blush brushes but the bristles are still soft and amazing for applying foundation. The Koyudo white mushroom is here just for size reference because it is nothing like the Fine Kalla kabuki. The Hakuhodo Maple kabuki is also just truly amazing but the price is much higher, at least you can see that the hair are very different. This Fine Kalla kabuki is terrible and for that price I could expect so much better. The handle of the Hakuhodo is so much nicer but again, not the same price range ! New brushes : web discoveries – Part 1 was last modified: August 18th, 2013 by Sonia G.
Awesome Sonia! You are our pioneer!! I am on my way to FL ( not driving…. Just a passenger 😉 ) soon as I get there I am going to have to “repossess” my iPad and do a little research (= place an order. No, I haven’t ordered the powder one but gosh I am tempted now, I will resist for now… it’s really expensive ! Hi Stacy 🙂 he is going to Miami ! but mid-January only. Thank you!! You are like magic!! Don’t know why I couldn’t find it!!!!!!! We are about 2 hours north of Miami. Thank you for helping!!! As always!!!!!! I have to save the links otherwise it takes me ages to relocate them! haha I see 🙂 great timing to place orders ! Give me a hint…. Is the Fine Kalla in the list? I have an eye shadow brush http://global.rakuten.com/en/store/akachanfude/item/398126/ in the cart as well…. These carts get fuller and fuller when you have too much time on your hands…. I want a pic of your dog!!! yes it was a bit late 🙂 the days don’t have enough hours !!!! Oh the one you just linked it’s certainly fantastic ! go for it ! just back from a long walk with the dog and we saw many many chamois, I was just a few meters away from them and I could film them with my phone, gorgeous ! I LOVE your discoveries! I really enjoy the thrill of hunting down what could be the new non plus ultra brush, BUT we can’t ALWAYS get lucky with new brands. I actually laughed at this pic. Poor old Kalla just didn’t stand a chance. Send me your shopping list for NY! You are so right Buggsiebee, most of the brushes are not bad, we are indeed comparing them to the ultimate ones. maybe I got a bad one and maybe yours will be fine !! Oh the Fine Kalla cheek brush looks nice. Oh did you hear anything good or bad about piccasso i found this brand too because i wanted to see if there is any other red squirrel cheek brush 😀 When i read the name piccasso, the da Vinci brushes are comming to my mind ^^ and these brushes are not the best in quality…. I got a red squirrel brush from Piccasso, in a few words, they are soft but not as soft as the one I have from Koyudo and the Piccasso are blacker in comparison. I got a few brushes but I still have to try them ! They have just been washed and are now ready to use… Piccasso delivered so fast, actually the fastest ever and they sent me a great brush pouch that I am looking forward to using ! I will keep you updated ! Thanks for introducing these new discoveries! I can’t wait to read your Picasso reviews — Jung Saem Mool videos make them look so tempting. Can I just ask where you acquired your Suqqu brush? It looks unlike every one I’ve seen (dozens, in person) and I know there have been a few fake Suqqu’s floating around. I’ll give you my thoughts as soon as I tried them ! I got my Suqqu cheek at the Selfridges counter in London Oxford Street, it was a long time ago and I did not see many pictures before, therefore did not know that it was different. Do you think they could have sold a fake one at their counter ? Oh gosh, I hope not! That’s my local counter so I’d hate to think they had problems 🙂 Perhaps it’s batch variation, as these are all handmade. Your Fine Kalla brush looks beautiful! Karen also got a brand new Suqqu face brush from them that was extremely different, but not only different, bad shaped. They said they will exchange it, so I hope Karen got a new one ! thanks for your visit Kate ! I love to read your blog, your writing is captivating ! I adore your blog but it is too dangerous for me to visit 😀 Sweet temptations indeed. At least I got 2 nice brushes from this purchase, and the little cheek one was really worth discovering ! Athough I’m pretty certiain that you got yours in London ( Selfridges? ) & that yours is the real thing, mine – ‘ Dollyleo = R.I.P.’ – also looks different…..tighter (less splayed ) and rounder . In fact, when I lay my Suqqu blush brush on your pic of the Fine Kalla cheek, they are identical twins. The Suqqu powder brush which Kay received from Selfridges ( who apparently gets delivery from some local Brit co??? ….rusty brain cells….ask Kay !!) was also WAAAAAY off the norm. Hmmmm….not implying anything at all, but this is perhaps worth investigating?! Yes Karen told me and showed me the pictures and video and I told her to contact them, it was not normal at all !!!! I’m on my phone atm so I won’t make a long comment until later. But I think the Fine Kalla brushes are from the manufacturer Kyureido. They have a website if you want to check it out and they have those brushes! And just quickly browsing on my phone again, without a translator >< but this is my opinion. Fine Kalla appears to be the….romanisation?, of Fine Colour, which is what I think they call their brushes. Its manufactured by Kyureido. 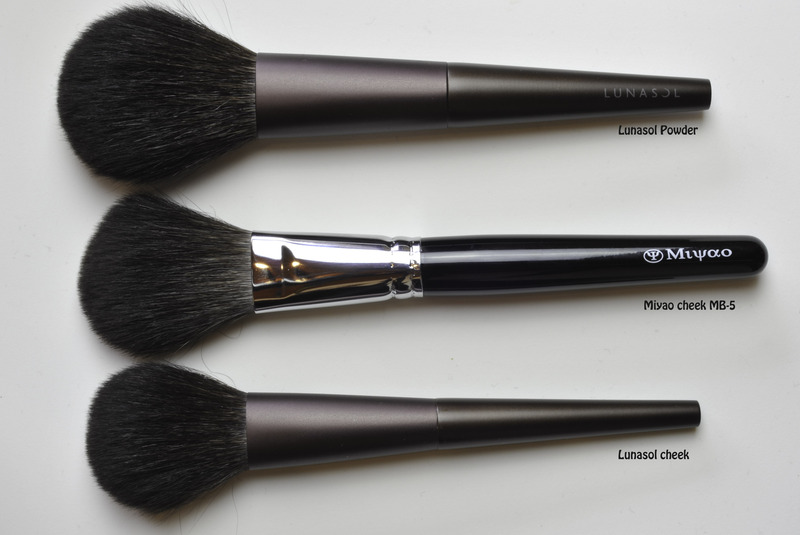 That beautiful cheek brush is what I think is their prestige line, like Chikuhodo's Z series. So serial numbers starting with KK. KT is the next line down. And KN is probably their basic series! Hope that helps with understanding the quality difference! I'm lemming the KK-0040I think it was…looks like the Z10. Hi Bonnie, This is incredibly helpful thank you ! these series looks exactly like the same brushes that are sold by Suqqu ! Fine Kalla isn’t the brand name of that lovely looking cheek brush. I went and took a look at the manufacturer’s website. The brand name is Kyureido. You really got a good deal on it on Rakutan though. The normal price is for that brush is twice that amount. And thanks to you, I have another brush to lust over! Actually the price is exactly the same as on Rakutan. 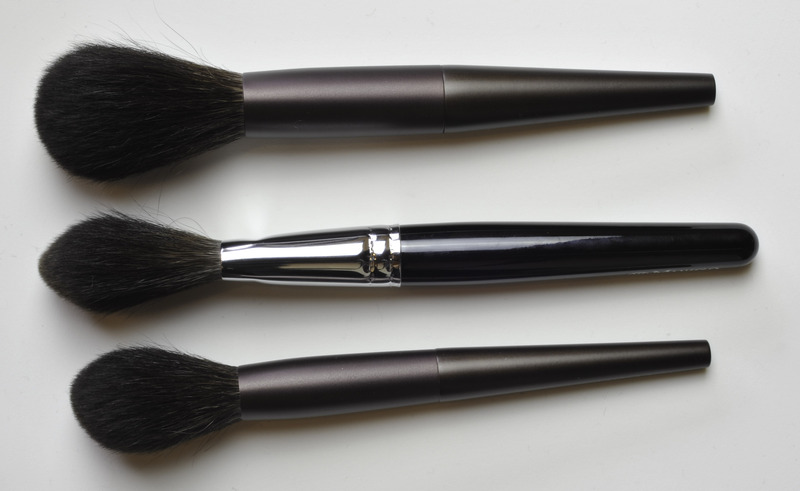 Perhaps you are mistaking the blush brush with the powder brush? Hi, this is Karen, aka Kay. Good news! Suqqu London is mailing me a replacement brush for the asymmetrical one that was sent to me from the Suqqu counter at Selfridges. I don’t have a clue as to why mine was so poorly shaped and no one has offered me an explanation but despite the aggravation, I’m very happy that an exchange was offered and I will be reimbursed for costs over and above my original payment. I really appreciate bloggers and friends who reviewed my photos and video, confirmed that my brush was “not right” and urged me to request an exchange. It gave me the confidence I needed to pursue the situation even though I was initially told nothing was wrong with the brush. Will let you know what I think of my brush after it arrives! sad … I hope you will get a great one !!!! Thanks so much for your empathy. In the grand scheme of things, it’s not an important incident, but I sure was disappointed as I expected a beautiful face brush given the raves about it and the high price point and received something subpar. I have never received a misshapen brush from Hakuhodo or Chikuhodo so this was a total surprise. Here’s wishing you and yours a Happy New Year! 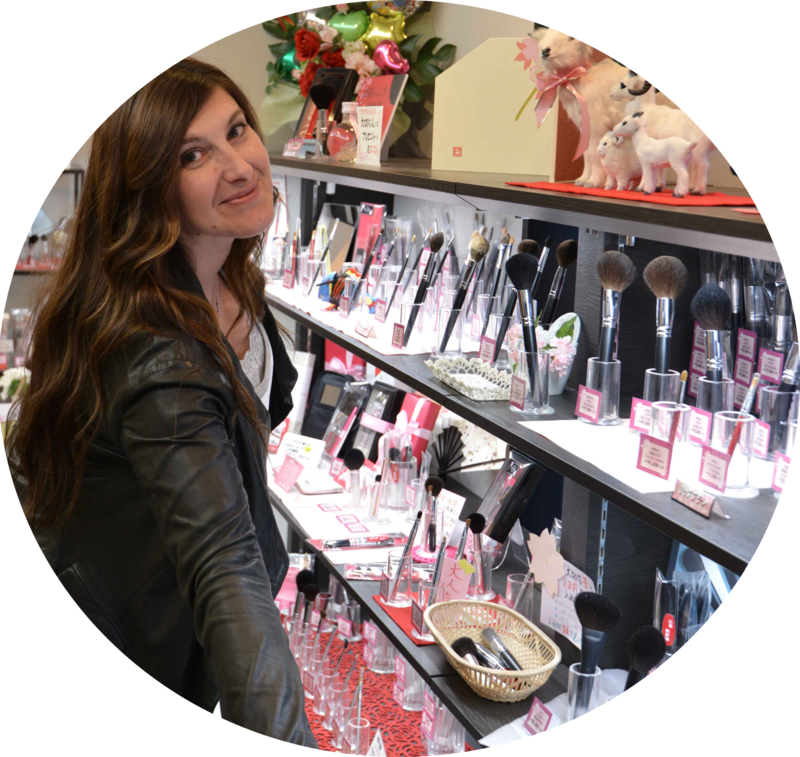 May 2013 be full of exciting discoveries, much laughter, good friends, health and happiness for all of us brush devotees on Sonia’s blog! Hi, I got my Suqqu face brush in the mail today!!! There was a sweet personal note apologizing for the inconvenience that really touched me…I am a sucker so told them they didn’t have to repay me for the mailing costs back. I’m just so relieved it is over. This brush is a huge improvement over the asymmetrical one I first received. It is not perfectly tapered like the one in the Lisa Eldridge video…it looks like the one in the Wayne Goss review and I’m happy with that. If it is good enough for Wayne, it’s good enough for me! BTW, no one has said there was a problem with the brush I sent back but I hope more care will be taken with regards to what is considered acceptable to sell. I expect more when the price is so high and I don’t think I am any different from other people when I say that. While I know these brushes are handmade and most of my soft squirrel brushes are not perfectly symmetrical, this one was way off the chart. Enuf said, case closed! PHEWWW ! glad you got it and that it ends well !!! I am relieved ! I had seen the Fine Kalla 002 brush on Rakuten before but was to scared to make the purchase. It’s great to know its comparable to the Suqqu especially that it is so hard to get one’s hands on here in Australia! Thanks for the review. It will be my first brush purchase in 2013! I got my Fine Kalla brush today and I have to say I am in love! It’s not as dense as my Chikuhodo Cheek/Highlight Brush but I will have a special place in my brush collection as well as in my heart! Thank you for letting me know Kim ! Thanks so much for sharing! I’ve been looking at these brands for couple of months now. Planning to go on vaca to Japan next year, so your review is a huuuuge help to finalize my wish list when Im there 🙂 Im afraid I’ll walk out with a suitcase full of brushes! They do deliver outside Japan too! How is the KK-002 compared to the Chikuhodo Z4? same softness/size do u think? great that they deliver internationally !!! I don’t know these brushes yet! the KK-002 is softer in comparison, very slightly but yes, softer. The Z4 is also bigger, larger and thicker, ferrule width is approx 1.4cm for the KK-002 vs 1.8cm for the Z4, the hair length is the same. Two amazing brushes ! Sonia, what a fantastic discovery! I am so excited by the KK-002, and I am also going to order the KK-003, which looks a little like the Suqqu eyeshadow L brush, which is an absolute must-have for me. Meanwhile, my Koyudo order is in the UK at customs – I am beside myself with excitement! Happy New Year my dear ! I will certainly meet you again in 2013 🙂 maybe at IMATS ??? May I please ask you whether the products your order from Rakuten and Koyudo are stopped at Customs? I am always curious about orders coming from outside the EU and the anxiety of whether they will be picked at Customs and therefore delay and be subjected to a significant markup due to import taxes, is what always stops me. Hi Marina, are you in Greece ? for me yes they were both and I had to pay taxes on them (a lot), I am in Switzerland and I don’t know if there is a difference with EU countries, I think it may be slightly different from here anyway. Mm I think that taxes differ from country to country, but your *a lot* comment made me shiver. The fact that they only use EMS is a blessing and a curse, as the items get here in half or in a third of the time than they would, had they been shipped using simple registered International Mail services, but EMS packets always get stopped at Customs and the overall cost goes through the roof. I am wondering how helpful their customer services both at Koyudo and Rakuten is? Maybe they would accept to switch to International Mail instead of EMS or mark down the value of the enclosed items? You did the impossible. I no longer want Suqqu cheek brush! 🙂 I just need to get Fine Kalla brush now. It’s a shame that Suqqu is not like other ones you’ve seen. At the price, I feel like it should be consistent. 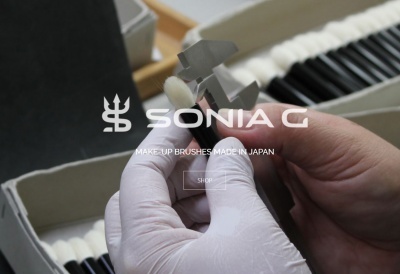 Sonya have you seen this Japanese brand before? I think I need this set lol. Off course I will let you all know how it turns out. I was hoping its the ‘white twin’ of the FuPa02. Eagerly awaiting your review of it. I saw it as well last week but I’ve been buying soooo much recently 🙁 Must resist! excellent !!! pliz pliz pliz let us know what you think ! I took the splunge and ordered 4 brushes from 4 different brands. The Mineyama goat and 3 gray squirrel. I expect to receive them in 2 weeks! 粗: coarse, 光峰: high-grade goat hair ; “粗光峰“ together refers to a type of goat hair, I’m pretty sure this is Sokoho (ie, Hakuhodo S100 and G543). There can be other types like “细光峰” Saikoho (ie,Hakuhodo Saikoho Kinoko). I would be soooo happy if it feels like the G543. In fact I was looking for a longer haired G543 with the same density. Although the G543 is not so soft when using with powder (loose or compact) I love using it with liquid foundation! blends like a charm. I only wish the hair was a bit longer. So Im praying I get the same effect with this brush!! Cant wait to have this in my collection!!! No problems 🙂 Glad to help dissect! Usually I get lost on Japanese sites, but I recognise the occasional Kanji, the Chinese-looking characters, like the “gray” in gray squirrel haha! Yes, I am VERY interested in this set actually but I had a few disappointments with the softness of two white goat brushes that I recently bought (that weren’t that cheap), I like to have more info about the white goat hair used for the brushes but as you can imagine it’s just not easy at all to get that kind of info, specially when the companies don’t even offer an english website. What got me interested to try more brushes from Koyudo is that it was written “baby goat chest hair” or also for the Tanseido brushes it was written “Hosomitsu”, which are both excellent quality hair. I am still going to continue trying more japanese brands -that’s for sure- but when it’s written “finest goat” sometimes it’s not that fine compared to other brushes from Hakuhodo, Tanseido or Koyudo (been there), but I will never stop hunting anyway 🙂 I am sure that if we keep hunting we will find amazing opportunities !!! I just discovered you blog this past week and it’s right up my alley. I wish I had this information when I bought 30 brushes from Hakuhodo a year ago, it was hard making those choices then. I ordered the Fine Kalla Cheek brush since I’ve been wanting the Suqqu cheek brush, but the shipping to the US is ridiculous, so I don’t own it. I can’t wait for it to arrive. My question is this: is the Fine Kalla very similar to the Chikuhodo Z-4? I have the Z-4, Z-8 and Z-10 on back order with Malin and just wanted to see if I need the Z-4 if I have the Fine Kalla. I’ve spent a lot of time reading your blog and find it so helpful. The comment sectikn is awesome too, good information and tips shared and the commenters seem so friendly. Thanks for taking the time to put out such a blog where it obvious you’ve dedicated your heart to. Well, honestly you don’t need the Z-4 if you have the Fine Kalla BUT, if you are a brush lover, you will want to collect these Z-series, if there is a set that is a dream to have is the Z-series. I agree, the comments are bringing so much insane information here, I really enjoy reading them and learning so many things from you all ! Thanks so much for your reply, I have time to decide, I’ll wait until the Fine Kalla gets here and see what I think. I also saw that you use the Tom Ford Shade and Illuminate creams and I have that on back order as well. What brush would you recommend for that? I have the Hakuhodo 210 and the S103 which I think might work, but I believe you might have a better thought on this. I don’t know if you’re familiar with this brand of skincare, but you might want to look into Tatcha. It’s a Japanese brand which has awesome natural ingredients and no toxic ones. I have combo/oily skin, but I introduced the line to a friend with extremely dry skin and she loves it. They have a line for every skin type and their customer service is world class. Their website is Tatcha.com and they have a sampler kit which is a fantastic deal. I didn’t get that, I just jumped right in and don’t regret it one minute. My skin is better than ever before and I’m in my early forties. Thanks again for all the info you share. Love it. Hello again, I received the Fine Kalla cheek brush today, washed it and played with it as soon as it was dry (drying time was about 5 hours). Oh my goodness gracious, it is the softest thing ever. It has a lot of flexibility and moves just like the Suqqu in Lisa Eldridge’s videos. I am thrilled with it and looking forward to actually applying blush with it in the morning. The shipping time was 7 days and the brush was well packaged, I will definitely buy more brushes from this line. Thanks for helping me find the dupe for the coveted Suqqu cheek brush. I never could justify the shipping cost to the US. You are welcome Carlyn 🙂 I am so happy you love it, really really happy ! thank you for the feedback, it’s good to know the quality and the service is consistent. 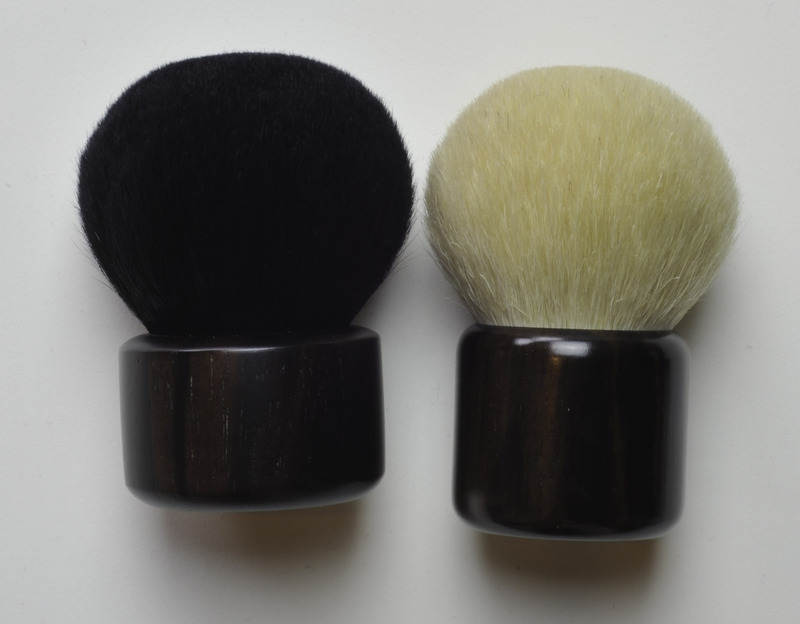 So, update on the Fine Kalla cheek brush- pure LOVE. It’s so ridiculously soft and pliable that it feels amazing on the skin. I used the Dior Rosy Glow blush in Petal and it was such a treat to use this brush. I over applied because I couldn’t get enough of the strokes, haha. The application was smooth and well blended and has lasted over 5 hours without any fading, there’s something to be said about lots of thin layers. I highly recommend this brush, definitely my new HG. It’s a fantastic brush to have, even if you have the Suqqu (although for me they happen to be two completely different brushes since the Suqqu is not tappered at all!). I saw in another post that you were concerned that your Fine Kalla cheek brush was shedding a little. What is the update on it? I have used mine every day since I got it and it hasn’t shed one hair. I’ve washed it once after the initial wash and its still perfect, I love it so much. I hope yours is doing well too. I also checked on cdjapan and my red squirrel cheek brush is in stock, yay, but the 2 Fu-pa’s I ordered are not yet ready. Can’t wait for my shipment. Thanks again for the recommendations. if you love the Fine Kalla you are going to adore the Koyudo red !!! I am new to your site, but have been reading your blog for hours now. Such a big selection of brushes you must have! I am on the look out for the softest brush I can possibly find. I was going to buy the Suqqu cheek brush, but wanted to see if I could find anything softer. I found this post, saying the Fine Kalla is equally soft, which made me doubt which brush I should get (both perhaps?) After reading your blog, I am sure you are the one to ask: Which is the softest brush you have come across? I am sorry of you already wrote about this, but in that case I would welcome a link. if you are eyeing the Suqqu cheek, you need it because that’s a truly fantastic brush that you will regret if you don’t get, full stop. For Christmas I will release a new brush database (just my brushes in there but still a lot of them…) where I have created a section for a selection of the softest ever (squirrel, goat, blends) so that may interest you. First I’d like to thank you for replying. I think it is great that you do, because it must take a lot of your time, but it’s really appreciated! So I was going to get the Suqqu from Selfridges as a christmas present, and they just sold out 2 days ago (terrible!). But then I saw your link to the Koyudo red squirrel brush, and I was over the moon, because I saw it in your 2012 brush awards, and was so dissapointed it was sold out on their own site. So I just placed an order! Can’t wait for it to arrive. It eases the pain of not being able to get the Suqqu cheek brush. I am thinking of getting some of the shader brushes from the Z series, but well, one brush at a time. I am looking forward to your brush database – it sounds amazing! yes one brush at a time, better to splurge on very LE items as you did! Ok, now I feel retarded, but cant find the KK-002. The links above seem to be broken or something… Could you please help me? hmm no I can only find the sets… maybe if you contact one of the sellers they can manage to get you one of the KK-002 alone ? I would try that, sometimes they can!